The Federal String Band feature tight three part harmonies and sing a unique range of styles, from railroad hollers and gravelly delta blues to country, gospel and the high lonesome sound typical of bluegrass music. They play a combination of acoustic stringed instruments and bring together a delightful collection of their favourite old and new Americana songs, from the traditional to the alternative. Their sound is heavily influenced by traditional American roots music. They perform in the styles of high energy bluegrass, lonesome blues, heartfelt ballads and country-swing, including rousing standards and their own compositions. Originally from Amsterdam, guitarist Frank John immigrated to Auckland. Whilst working at Lewis Eady’s in the 1980s, he met Nigel Gavin during a product presentation with Gary Verberne. Frank later enrolled at the Creative School of Musicianship, where Nigel was a tutor. It was through this that Frank joined the infamous Gitbox Rebellion, albeit briefly. Frank met Erin Manu, his wife, in the mid 1990s whilst working at Mainline Music in Auckland. Within a few years they were working for the Rockshop, in sales and administration respectively. Erin had started playing guitar at the age of seven, however encouragement and patience from Frank has been Erin’s impetus to develop her music. They started playing music together and discovered they had “a sound”. Once a month jam sessions with some musos introduced them to a full range of Americana music. They would meet at Janek Croydon’s Photography studio. Fellow jammers included Cameron Bennett, Wayne Gillies, Lorina Harding, Harmen Hielkema, Mark Dombroski, Peter Parnham and of course Nigel Gavin. Frank and Erin relocated to New Plymouth in 2005. They had difficulty finding anyone who could play Americana music, so set about playing a few gigs. They ended up performing at TSB Bank Festival Of Lights, Parihaka Peace Festival, Bowl of Brooklands, G-TARanaki, WOMAD Performers BBQ and the NZ Women’s Surf Champs. Cameron ‘Dusty’ Burnell was raised in the Far North of New Zealand. After relocating to Taranaki, Cameron met Erin one day when he came into Erin’s Sewing business to have his trousers altered. Erin had the DVD Down From The Mountain playing on the shop computer. Cameron recognised a track by Alison Krauss and struck up a conversation, upon which Erin directed him to Janet Muggeridge for extra mandolin lessons. Cameron, Frank and Erin came together at Mike Harding’s summer solstice jam in 2011. A few months later Cameron, being a photographer with Fairfax, was shooting a slip on Mt. Taranaki. When he arrived back to the office he was covered in dust, hence his nickname Dusty. Frank and Erin have always performed under their own names. However, when they started adding Dusty to their gigs, they hastily settled on the performing name The FEDZ, being an ancronym of their first names, Z being for the occasionally borrowed and unknown bass player. Throughout 2012, with Dusty now in the lineup, the group performed throughout Taranaki, including the New Plymouth Boardriders Club, Hollard Gardens Harvest Festival, The Great Eltham Cheese Festival, Rosies Irish Bar in New Plymouth and AmeriCARna. 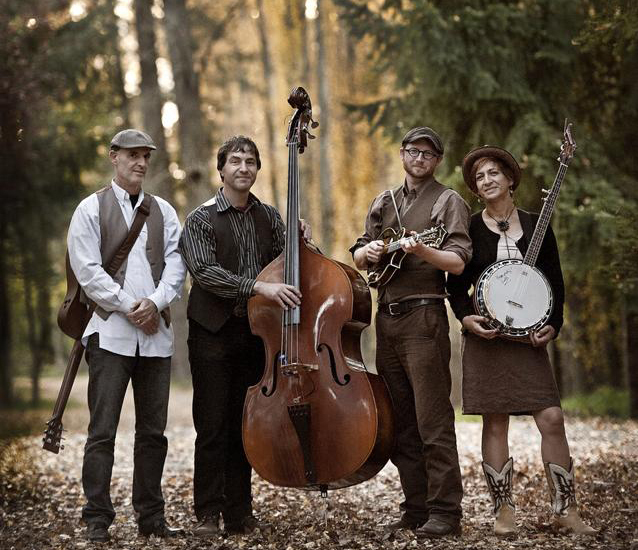 In October 2012 The FEDZ ventured to the Wellington Folk Festival, where they met Andrew Bicknell, President of the Wellington Bluegrass Society and an experienced bass player. They got together, performed on an invitation concert, where the music flowed as though they had been playing together for years. They vowed to get together again soon after, but it wasn’t to happen until the following year, also at the Wellington Folk Festival, where they were asked to be the final act in the Saturday night invitation concert. Once again the music flowed as though they had been playing for years, even though this was only the second time they had performed together on stage. The crowd loved their music, and the band loved the feel and muscianship whilst performing both on and off stage. In April 2014, The FEDZ were one of the Festival guests for the Canterbury Folk Festival, where they closed the final concert. After this they rebadged as The Federal String Band, then in May performed throughout both Taranaki and greater Wellington regions, and are planning to record a CD then tour the upper North Island in October. The Federal String Band are looking forward to being a guest at the Wellington Folk Festival, also in October.